According to the latest research published in the British Journal of Cancer, chemicals in Cannabis have been found to stop the growth of Prostate Cancer cells, which suggests that Cannabis-based medicines can help fight the disease. Cannabis sativa is an herb used by humans as a source of fiber, as food, as a drug, as medicine and for spiritual purposes too. 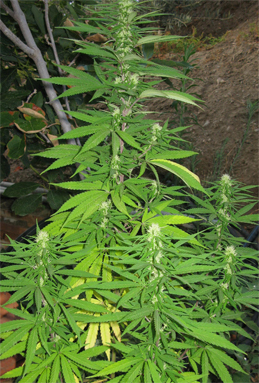 The preparations made out of flowers of this plant are known as marijuana. Scientists from the University of Alcala in Madrid, after working initially on human cancer cell lines, tested one compound on mice and found that it brought about considerable reduction in tumour growth. Experts emphasize that the research is still exploratory and there are several more years of testing required to work out on how to apply the findings to treat cancer in humans. The cannabinoids tests by the team are thought to work against prostate cancer as they have the ability to block a receptor or molecular doorway on the surface of tumour cells, and this stops them from dividing. The cancel cell receptors can actually recognize and talk to chemicals found in Cannabis, said Diaz-Laviada the study lead. The chemicals have the ability to stop division and growth of prostate cancer cells and may be used as a target for new research about potential drugs to treat prostate cancer, she explained. Laviadas team worked with two cannabinoids, methanandamide, and JWH-015, the first demonstrations which indicate that cannabis chemicals prevent cancer cells from multiplying. Few drug companies are already exploring the possibilities of cannobinoids in cancer, including the British-based cannabis medicine specialist GW Pharmaceuticals.